The biannual meeting of the Regional Council drew priests and members from Johannesburg, the Western Cape, Namibia and Germany to Durban. To reach Durban called for much courage from most travelers – from the Cape majestic cumulous clouds caused much turbulence and one plane reverberated ominously with the sound of a tumble drier spinning the contents of a toolbox. The cold front having freshened up the profusely flowering gardens of the Cape, now descended on Durban in chilly mists, rain and inevitable lightning and thunder. The lightening challenged the power supply but fortunately we were only in the dark for a breath or two. The Durban Christian Community is situated in Kangalani Way on a superior hill overlooking the Valley of a Thousand Hills. The mists and low cloud intermittently granted us a brief glance at the magnificent view. The small chapel space, situated temporarily in part of Peter Holman’s house, became the central area for services and meetings. The gathering was blessed by 6 priests in our midst and reports were sprinkled with miracles and initiatives troubled by financial worries, a fitting picture during this time of St Michael fighting the Dragon. Yet after each trail and tribulation came some positive outcome, urging us to refocus and keep on going. The Regional Council has a “warm and lively interest in all the centers – in the needs and struggles of each community in the whole region of southern Africa” to quote from their March minutes. In addition, we were fortunate to have two visitors from Berlin. Vicke von Behr, one of the Circle of Seven and Armin Knabe, chairman of the Foundation of the Christian Community, a worldwide initiative. Vicke von Behr’s sermon reminded us to keep our awareness focused on the spiritual beings who are interested in and supportive of our activities. Each community has its angel, as does the Foundation which encompasses initiatives all over the world. In a follow up conversation he offered further insight as to how awareness of our community angel could be strived for, arising through us experiencing these angels between two or more people “gathered in My Name”, coming together selflessly, in free community, for the movement of spiritual renewal. These angelic beings can be experienced between two individuals meeting, not from the point of view of their personalities, but when they communicate from the pure “I”, from the “Christ in You”, both having overcome their self interest and personal issues in the matter on hand. Armin Knabe, chairman of the Foundation, a tall Father Christmas figure with a large ginger beard, appeared like an angel overseeing all the Christian Communities around the world, through the Foundation. He described how awareness for this world wide movement can be awakened in the following way: at the Christmas midnight service, imagine preparations for the dawn service over New Zealand, then Australia, followed by Tokyo 2 hours later; with candles being lit, a bell rung, the beret handed over and the book opened … and carry this around the world. This meditation can also be done every Sunday – and thus one creates a possibility to feel our own congregation is not alone in the world. Only two weeks ago the first Christian Community had its founding in Spain (interestingly this impulse was initiated from South America – the reverse having happened in ages past when Christianity moved from Spain to Argentina). Next year the first Community will be established in Budapest, Hungary. The Foundation supports the leadership of priests in 16 regions, with 550 priests and 220 congregations - financing training, ordinations, travel expenses, vestments, retirement funding, illness and relocations, with a particular interest in pioneering communities. The Foundation supports the Circle of Seven, the leadership of the Christian Community. 80% of their income is derived from Europe. From our worldwide view we returned to focus on the regions. Our gathering had started with a biography related by Herbert Schneider aged 91. Like the Valley of the Thousand Hills, he led us along the historical ups and downs of Anthroposophical activities, during which stables twice comprised premises for their work. Now Rev Holman pointed out possibilities of the stables on the lower slopes of the new premises becoming their chapel, and showed us a model made by Christopher Bester, encompassing the existing structure. In this particular part of Natal conservation stipulates limited building developments, so the stables already in existence gives permission to transform these premises. The turn of events regarding the relocation of the Christian Community from Shongweni to the new property in KZN (presently in search of a name, situated on Kangalani Way) lifted from the thick mists of drawn out legal procedures to a glimpse of encouraging sunshine. Our Lenker, Reingard, had as part of the release of the Shongweni property, received the Foundation Stone of the church. This copper dodecahedron had fortunately not been laid in a concrete foundation and as she received it, the normally soldered closed lid opened miraculously. This “open” gesture was most encouraging to the future of the work in KZN. To her surprise she discovered her name on the scroll placed within – she had attended the foundation stone laying with the Youth Group, one of them being Christine Burger who was on the last hike of her life before she lost the use of her legs in a car accident soon afterwards. This opening gesture of the dodecahedron points to the receptivity of the new property and the fact that we are not alone but surrounded by the Community Angel and those who have died. A new step can be taken now, not as a mere transference, like putting new wine into old vessels. The Johannesburg community’s raised funds for their new wake room project, which unfortunately had to be postponed when the funds were used for simple survival. The Windhoek community saw much activity with two priests, however Rev Frank Storm, active as a teacher as well, has to return to Holland due to a serious health issue. Cape Town reported on their building project for the elderly and vision building to create the awareness of free community. The West Coast had to say farewell to Rev Reglind Kuhlcke whose visa expires. An interesting aspect arose: when a project is envisaged, funds arrive. Money should never be the decision maker for a project. Vicke von Behr asked: How can we allow the younger generation to find us? Seldom priests ordained these days are younger than 40, whereas at the founding of the movement, Emil Bock was one of the oldest, aged 27, while the others were between the ages of 19 and 24. The archangel Michael fights the dragon – and the dragon wants to eradicate, crush us and paralyze us like a rabbit in front of a snake. Anthroposophical and Christian Community activities really worry him – there is little in the world which derails him as much as our active working. Michael is the countenance of the Christ; Michael and the Christ are one. Finally our view turned to our next meeting where we can, as suggested by our Lenker, gather in the greater context of our intensions, and as suggested by Richard Goodall, further our striving to develop free community. Our financial distress can only be solved through a free community’s becoming conscious of their individual responsibility. Approaching the gift which the Christian Community brings to our regions in freedom, can awaken our responsibility to reciprocate to the impulse and finally set each one of us truly free. Article published in Perspectives in 2010. The Regional Council has evolved from a body of administrative and financial individuals concerned with the survival of the Christian Community in Southern Africa, to a group concerned with every aspect of the Christian Community, its sacraments and spiritual touch. The Council alternates its meetings at different congregations, presenting possibilities to meet different communities. The Council started its meeting this time on a delicate subject of a change, enormous to some and negligible to others, to the words in the Afrikaans Menseweidehandeling / Act of Consecration of Man in Afrikaans – specifically the adjustment to a particular two words: “U” as the venerated “Thou” and the “Jy” – the more familiar “you” address. The night before the Afrikaans service was celebrated by Christine Voights from Namibia, the common attitude was that the “Jy” should never be able to replace the “U” because of the venerable approach implied within the “U” form of address, particularly to God. However, after the beautiful gentle approach of the celebrant the next morning at 7h30, openhearted congregants experienced the simple “Jy” approach in all cases to be much more acceptable than expected. By contrast, some of the more archaic Afrikaans words such as “Bede” instead of “Gebede” for prayer, and “krankheit” instead of “siekte” appeared more obviously outdated with the simple “Jy” used throughout. The Menseweidehandeling needs yet another adjustment, another developmental growth, for often language evolves and words sound archaic. The original translator of the Act of Consecration into Afrikaans, Heleen de Villiers, attended the preparatory talks and the contemplation about the word changes. Proposals from the Tswane and Windhoek communities initiated these questions - the younger generation felt a need for the changes. Aaron Mirkin in Johannesburg and Ulrich Becker in Windhoek heard young students say: “This is not how Afrikaans lives for us.” With both of these priests now no longer in our region, Reingard Knausenberger, our Lenker, felt it a matter of spiritual hygiene to complete the journey which was started when these changes were requested. We were asked to consider it with open hearts and respect the fact that each language has its higher reality, its Archangel. However, never can one say a language decision is valid or not valid; each language evolves with time. Words attach themselves to a spiritual reality, good or bad. The Act of Consecration is the highest order in which words reach us, no matter in which language, it opens up to a new perception, Reingard said. We don’t at the moment have anyone celebrating in Afrikaans in SA. Neville Adams and Peter van Breda, now both overseas, used to celebrate and both asked that the “U” should not be “thrown out”. On the simple “U” form, many variations were considered. Eurythmists felt the “U” to be harsher than the “Jy”, several considered the “U” had a distancing, elevated aspect of “His Majesty” for instance, while others saw the “U” address as used to those you don’t know. The latter echoed with the thought that one became too removed in prayer and thus feel alienated as opposed to touched by the service, while another thought just the opposite, the “U” being an inclusive concept rather than a personal, singular approach excluding others. The Lenker reminded us that if there is no demand for the service in Afrikaans, it won’t continue to live. At the moment only Namibia celebrates in Afrikaans. The new priest to Johannesburg, Hugh Thornton, introduced himself. Growing up in Boston, USA, he attended public schools and met Anthroposophy in high school. He studied Spiritual Psychology in Vermont and spent a year at Emerson College. While he studied Waldorf Education his Hungarian wife returned to Hungary and he has a 14 year old son with her. He managed a restaurant and founded a coffee shop company but realized he didn’t want to continue after its first opening. Aged 36 he joined the seminary and was ordained four years later. This is his first visit to Africa. He helped Reingard at the last children’s camp – which boasted 92 children and 18 helpers. Reports from the regions brought us up to date. The vibrant warm Johannesburg Advent fair sustained them once again, although Mariette announced she will not be able to coordinate everything in the office next year. The new wake room group is continuing with their outer and inner considerations but will put the project on hold in order to create a suitable home for Hugh and his fiancé. The website will be developed by John-Peter in Johannesburg and have a link person in each congregation to keep events updated and questions answered. Each community would have its own Page to access and update. From Kangalani Way in KZN, they reported a 30% rise in income as a result of their plea that they were no longer sustainable – it is a make or break time for the community. However the cottage was fixed and is being let. The chapel development on the previous stables has been put on hold – in the meanwhile the wind blew the roof off. They desperately need 1.5 million to move the Wilmots off the Shongweni property. This amount will not necessarily be lost but it is needed as part of the eviction order. There are interested purchasers but they can’t sell with the Wilmots living there. Windhoek reported Frank had left and is having treatment. His wife is returning to teach at the Waldorf School for 3 months. Christine Voights is only able to maintain the situation and unable to introduce new ventures. Good rains improved the 64 oxen but initiated a leaking problem in the church ceiling. The green market was progressing well. Erasmus Spitta and his wife will be returning to Germany in 6 months. The community is pleased to have a born and bred priest in Rudolf Sudbrack. Camphill Village has for the first time in 42 years no priest to take the services. Reglind is on a boat on her way to Bremen after her 3 year stay. Many questions have developed around the Sunday gatherings and chapel which is the heart of the Village. Restoring and painting will de-consecrate it and there’s a move to allow other religious denominations to make use of the chapel – accommodating beliefs of others at Camphill. Upon its consecration in 1990 it was stipulated that changes could only be made to the chapel and surrounding cemetery in consultation with the Lenker. Cape Town’s children’s camp made a big impression on many children who showed immense appreciation – their parents noticing contented change and preparedness for Christmas. However this camp is not enough to attract more young parents to the church. The Advent Fair’s large tent hosting children’s activities set a trend to follow. The central theme for the Cape Town congregation has been to focus on children, having more inter-holiday activities and planning festivals. Our Lenker said children can build a foundation for youth work. A single youth conference will not suffice to make the youth aware of what we offer. In the Cape, Richard Goodall now has to serve 3 communities and the difficulties would not be celebrating but providing funerals for an aging population at Camphill. Reingard said it was urgent for the Regional Council to become a legal persona. Basics needed to be clearly stated and the funds would follow – our trust in these matters is important. She asked that each community needs to provide for one retired priest, whether making use of the Timour Hall Cottages in the Cape or elsewhere. Timour Hall Cottages were ready for construction by December 2010 but our primary investor, Mrs Gabler, has a son who is concerned about her investment, and questioning tax directives. A taxable amount will be charged by SARS when the investment is made. The church will be part of the body corporate of the Section 21 company (called Timour Hall Cottages) – a company which is “not for gain”. The sizes of the cottages had to be reduced to absorb the increase in other costs. Mrs Gabler is a founding member of the Waldorf School. Reingard compared the development to a “spiritual green belt” we are creating. On the final day Reingard introduced a new theme, believing the Council had reached a new stage in creating a situation into which a new impulse could be brought. A sure trust and openness had developed amongst the members. She urged us to develop and keep in our prayers and thoughts directed towards the development of an African seminary. 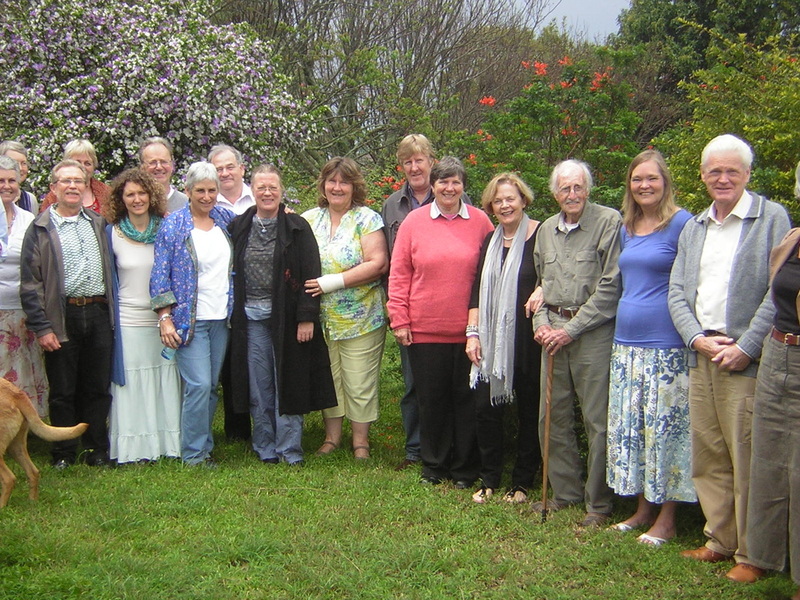 At the moment a group of students in Grahamstown, linked to the Christian Community, has brought the opportunity for a short course to be offered – and possibly interest some of the students in a short course from the Seminary – other churches offer such courses. Each one of us should find where we could be in contact with young people who would be interested in doing the first training year to become a priest – and thus ensure locally bred priests. Our intent should be to gather 50-60 students – we should raise our confidence and say we can do this. There must be youth who are not fulfilled in what they are doing and ready to meet Anthroposophy and the Christian Community. We must create an atmosphere for questions. In the spiritual world questions are ideal; in a circle of people growth is exponential compared with individual striving. A priest has the most universal career. She ruled out the effectiveness of a youth camp – this had been done in the past. We had to attract these young people and trust the impulse to grow. Rudolf Steiner wrote his own creed aged 28, and this could inspire others to do the same. Reingard reminded us to set our intentions and vision – for an extension of the community as a healing impulse in the world and our intention to create local priests. To close off the weekend we considered the role of the Council. From a place of meeting one another we have created a healthy, heartfelt interest in the various regions, a listening organ to carry the work forward, greater awareness and consciousness making us more responsible and accountable, and more involved to carry each others' project into our prayers and into the Act of Consecration of Man.